What is an SAE Formula Hybrid car? 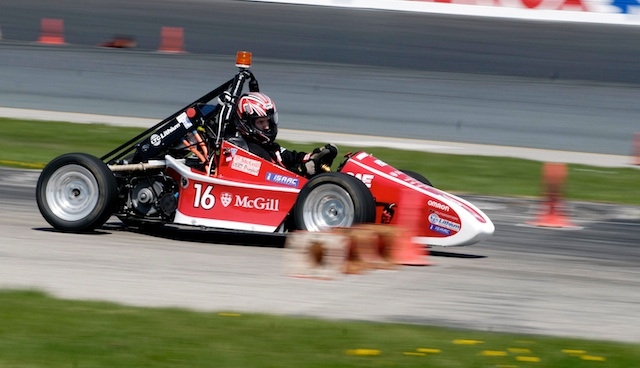 Like Formula SAE, the hybrid competition is based around the fictitious scenario of manufacturing a small Formula style race car to be sold to those interested in participating in weekend autocross events. Student design teams must design and manufacture a car that will be presented and put against cars from other schools. The non-static events are: braking and acceleration, as well as autocross and endurance races. The car must be powered by a hybrid drivetrain and conform to many rules set by the competition. Teams do up to 6 timed runs on a 75m straight, in both electric and unrestricted (gas/electric for parallel hybrids) modes. Only the best from each mode is counted towards the team’s score. Fast cars are typically below 5 seconds. 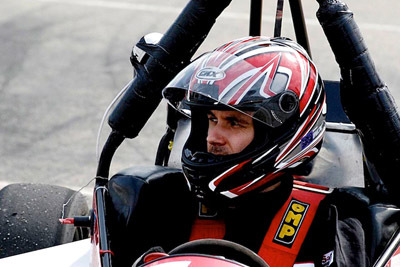 Autocross is a type of automobile racing that is not wheel to wheel. It normally takes place on an existing racecourse set with cones. This, along with the fact that only one car is on course at a time makes this type of racing much safer. The race is a time trial event, fastest time wins and the stopwatch doesn’t lie. There can be no excuses about the actions of other drivers, failure is the responsibility of the driver or the car. Autocross courses are normally quite tight, so instead of favouring high powered and fast cars, they favour quick and agile handling as well as fast acceleration. Normal speeds attained aren’t much more than 80 km/h. Typical course duration is 40-70 seconds. For this competition, there are two autocross heats. Only the best one is considered. Endurance is basically a series of autocross runs done consecutively. The entire race is 22 km, with a driver change at half distance. This race tests the efficiency and reliability of the prototypes, as well as their performance. Unlike past years, teams must not only finish, but finish quickly in order to do well. All teams are allowed the same amount of energy to complete the endurance, split between batteries or capacitors and gasoline. The amount of fuel allocated to complete endurance depends on the storage capacity of those batteries or capacitors. Teams compete in a number of events that do not involve driving the car. First, there is the design presentation. This allows students to justify their design decisions that resulted in the configuration of their car. It is encouraged to come to this event with data to back up these decisions. “Gut” decisions are not very well received. There is also the marketing presentation in which students “sell” their concept to pretend investors interested in putting the car into production. This deals more with the cost and impact of a certain design rather than it’s technicalities.